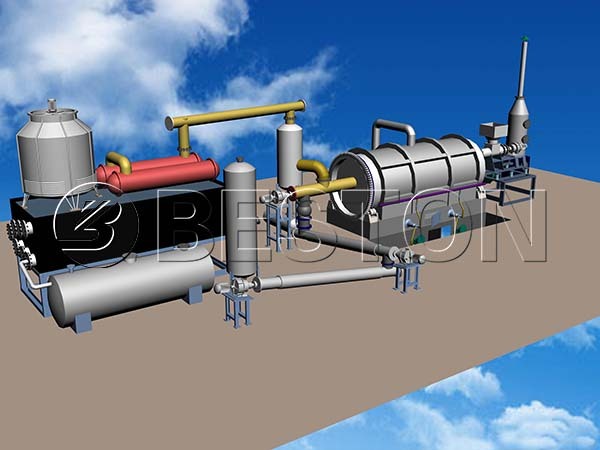 Beston waste tyre pyrolysis plant is designed to turn the waste tyres into oil, carbon black, steel wire and combustible gas through the waste tyre pyrolysis process. We can afford you BLJ-6, BLJ-10 batch operating plant, BLJ-16 semi-continuous machine and BLL-20 continuous plant. 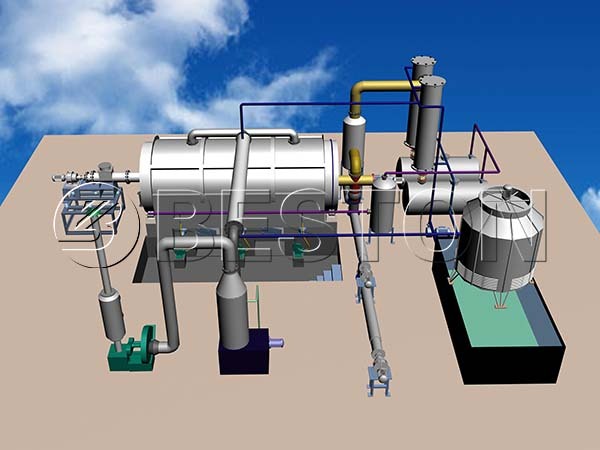 The working process is different between the continuous equipment and batch pyrolysis plant. 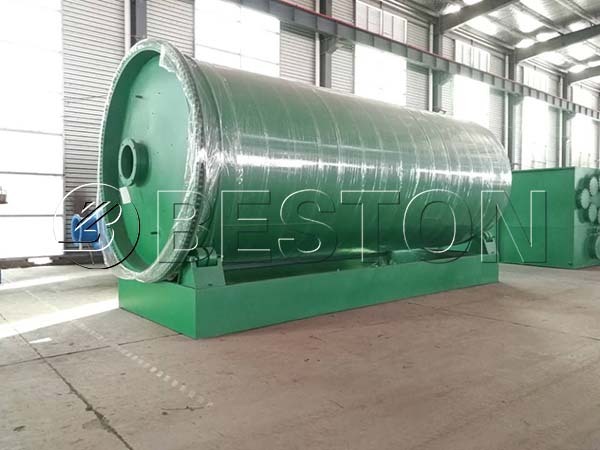 Here we list the continuous tyre pyrolysis process, and you may understand how can the waste tyre be converted into fuel oil. 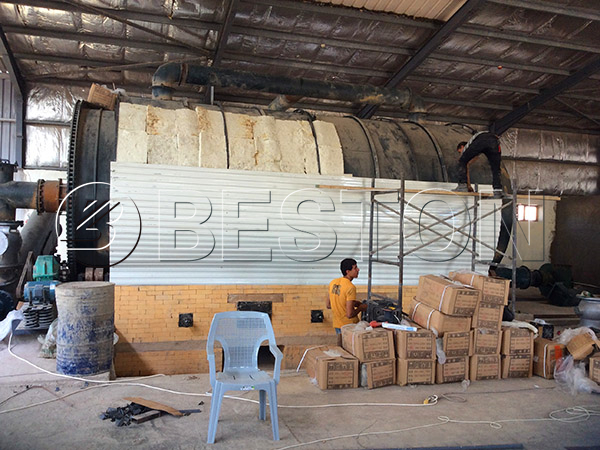 We have 4 models of waste tire pyrolysis equipment for sale. Here are more parameters for your reference. 1. You should remove the steel wire of the waste tyres firstly, and then use the tyre crusher to process the waste tyres into small pieces, whose size should be under 50 mm. 2. Put small waste tyre pieces into pyrolysis reactor by fully-automatic feeding machine. It is better to leave 1/3 space to make sure the reactor work smoothly. Then close the feeding door. 3. Heat the pyrolysis reactor by burning the fuel material (coal, wood, natural gas, LPG or other). The oil gas will appear when the temperature reached 200℃. 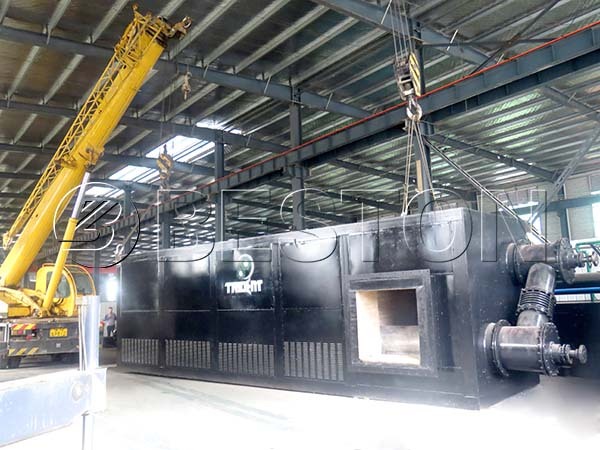 The 280-350℃ is the top output rate interval during the waste tyre pyrolysis process. Here is a video of the fully continuous waste tyre pyrolysis plant from Beston Machinery. 4. Heavy oil gas separated by manifold is supposed to be liquefied and drop down into the heavy oil tank. The lighter gas will rise up to the oil condensers, then be liquefied into oil and stored in the oil tank. The incondensable gas will go through de-sulphurization and de-dust process by hydroseal, and then the incondensable gas can be recycled to heat the pyrolysis reactor. 5. After all the above work finish, cool down the reactor. Carbon black will be discharged automatically. There possibly will be a little exhaust gas left. Through the purification system, the exhaust gas can be piped out without harming the environment. Or you can use the water tank to dispose of the flue gas. 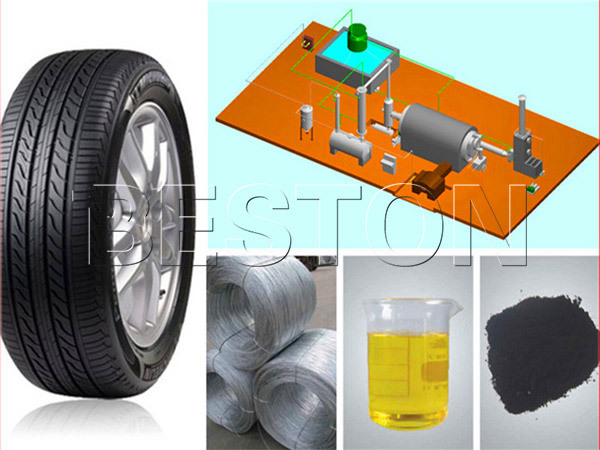 After the pyrolysis process, you can get the tyre pyrolysis oil, carbon black, steel wire and combustible gas. The followings are the usages of those end products. 1. Fuel oil: You can use to fuel oil as fuel directly. If you want to increase the value of the tire pyrolysis oil, the tyre oil distillation plant is suitable for you. 2. Carbon black: You can sell it directly in the market. 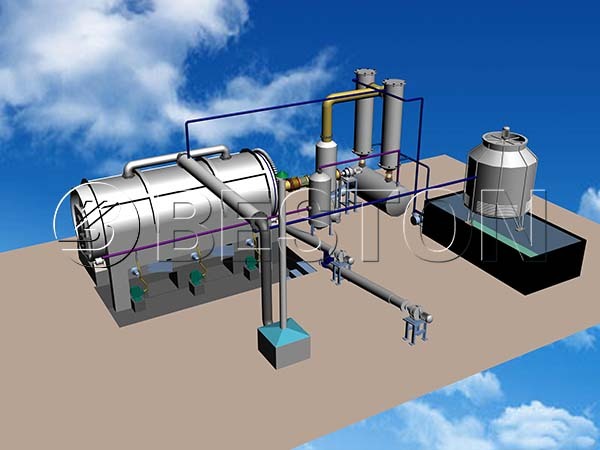 Or you can process the pyrolysis carbon black with the carbon black processing plant. The pyrolysis carbon black is about 50-60 mesh, and the carbon black processing plant can process it into 325 mesh or more. Then the processed carbon black can be used in plastic and rubber industry as fortifier, filler, and colorant. 3. Steel wires: You can sell the steel wires, and you can also use the steel wire to make steel bloom by hydraulic press-packing. 4. Combustible gas: The combustible gas produced during the tyre recycling process is mainly recycled to heat the pyrolysis reactor. Thus you can spend less on energy cost. This plant aims to make fuel out of waste for the fuel industry through the pyrolysis of tyres and rubber. In addition, it is also suitable for plastic pyrolysis, and waste oil sludge treatment. 1. The latest heating system combines the advantages of the direct heating and indirect heating, so the service life of the pyrolysis reactor is longer. 2. The professional thermometer and pressure gauge can inspect temperature and pressure at any time, which can make sure that the plant is working under normal temperature and pressure, so the tyre to oil plant will not cause any harm. 3. The perfect sealing system can make sure that the whole working condition in oxygen-free. 4. The purification system, such as the hydroseal, dedusting system and so on. So far, as a professional and trustful tyre pyrolysis plant manufacturer, we have sold our plants to many countries, such as Brazil, Jordan, Indonesia, Turkey. What’s more important, our customers speak highly of our products. This video is our BLJ-10 tire pyrolysis plant in Indonesia. You can find more details through this video. We all know that with the development of society, the land resource is more and more precious now. However, waste tyres take up a lot of land resource. When the waste tyres are exposed under the sunlight for a long time, it is easy for those waste tyres to cause fire accidents. Obviously, the untreated waste tyres are a great threat. 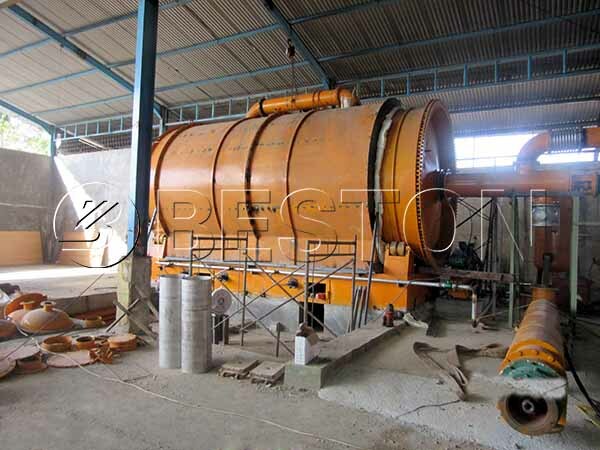 Thus, to find the top tyre recycling plant for sale is necessary. From the above mentioned, we can know that this machine is profitable. 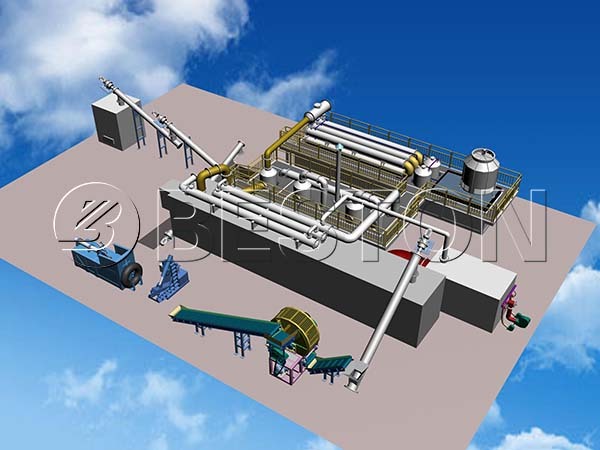 If you want to make an investment in the plant, or you are curious about the waste tyre recycling plant project cost, you can send us inquiry basing on the following chart.